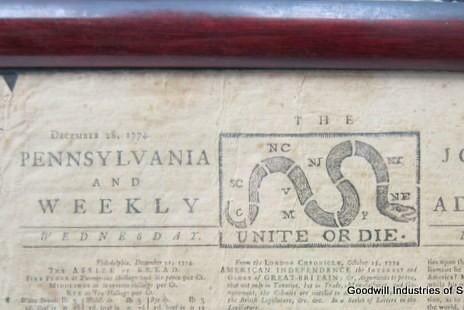 WOODBURY, N.J. – A rare discovery was made among the donations at a New Jersey Goodwill store: a newspaper dating from before the American Revolution. The framed December 28, 1774, edition of the Pennsylvania Journal and Weekly Advertiser was later verified as authentic by appraisers at Cohasco Inc., of Yonkers, N.Y. Experts say the artifact, which is currently valued at about $18,000, could increase in value as the 250th anniversary of the Declaration of Independence approaches.